Your resume should reflect the wide array of professional experience you've gained working as a temp. 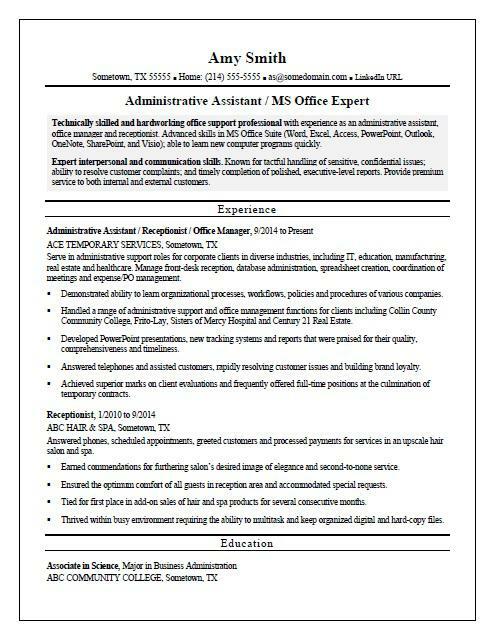 View the sample resume below, and download the temporary admin assistant resume template in Word. And if you need more help, let the experts at Monster's Resume Writing Service create a high-impact resume for you that will impress employers. According to the Bureau of Labor Statistics (BLS), a high school diploma or equivalent should be sufficient to land a job as administrative assistant. In this role, you can expect to make a median wage of $37,870 per year, or $18.21 per hour, per the BLS. You’ll find the highest level of employment for this job in the following states: California, New York, Texas, Florida, and Pennsylvania; and in the following metropolitan areas: New York City, Los Angeles, Houston, Chicago, and Washington, D.C.
Technically skilled and hardworking office support professional with experience as an administrative assistant, office manager and receptionist. Advanced skills in MS Office Suite (Word, Excel, Access, PowerPoint, Outlook, OneNote, SharePoint, and Visio); able to learn new computer programs quickly. Expert interpersonal and communication skills. Known for tactful handling of sensitive, confidential issues; ability to resolve customer complaints; and timely completion of polished, executive-level reports. Provide premium service to both internal and external customers. Serve in administrative support roles for corporate clients in diverse industries, including IT, education, manufacturing, real estate and healthcare. Manage front-desk reception, database administration, spreadsheet creation, coordination of meetings and expense/PO management. Demonstrated ability to learn organizational processes, workflows, policies and procedures of various companies. Handled a range of administrative support and office management functions for clients including Collin County Community College, Frito-Lay, Sisters of Mercy Hospital and Century 21 Real Estate. Developed PowerPoint presentations, new tracking systems and reports that were praised for their quality, comprehensiveness and timeliness. Answered telephones and assisted customers, rapidly resolving customer issues and building brand loyalty. Achieved superior marks on client evaluations and frequently offered full-time positions at the culmination of temporary contracts. Answered phones, scheduled appointments, greeted customers and processed payments for services in an upscale hair salon and spa. Earned commendations for furthering salon’s desired image of elegance and second-to-none service. Ensured the optimum comfort of all guests in reception area and accommodated special requests. Tied for first place in add-on sales of hair and spa products for several consecutive months. Thrived within busy environment requiring the ability to multitask and keep organized digital and hard-copy files.